Author(s): Hiroki Yamamoto. Department of Human & Environmental Studies, Kyoto University, Kyoto, Japan. Background: In functional brain imaging, intersubject brain registration is widely used to describe the loci of brain activation or lesions and to normalize functional data between individual brains based on anatomical similarities. However, such registration necessarily has limits because brain structure varies among individuals and is not always closely correlated with brain function. Objective: This study quantitatively compared three registration algorithms—linear volume-based, nonlinear volume-based, and surface-based methods—using probability and entropy maps of human visual areas. Methods: fMRI retinotopic mapping was performed in 16 subjects to construct a model for 12 visual areas. The surface and volumetric models of each visual area were registered to the standard brain template using the three registration methods. Results: After surface-based registration, the probability of visual areas being present in the common space was increased approximately 3-fold compared with the volume-based method, but the average probability was relatively small at approximately 0.3. On the other hand, average entropy was around 1 bit, revealing no significant difference between the two methods. Conclusion: Our results indicate that the current technology has room for improvement and thus should be used carefully with consideration of its limits. 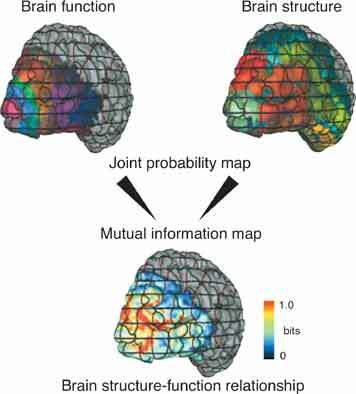 We suggest that the information-theoretic approach can be naturally extended to the analysis of brain structure-function relationships by taking advantage of mutual information. Keywords: Visual cortex, fMRI, probabilistic atlas, brain normalization, entropy. Affiliation:Department of Human & Environmental Studies, Kyoto University, Kyoto, Japan. Keywords:Visual cortex, fMRI, probabilistic atlas, brain normalization, entropy. Abstract:Background: In functional brain imaging, intersubject brain registration is widely used to describe the loci of brain activation or lesions and to normalize functional data between individual brains based on anatomical similarities. However, such registration necessarily has limits because brain structure varies among individuals and is not always closely correlated with brain function.